Visually a rectangular tart tin looks great. I bought mine off ebay, but you can get them here too. Worth having one in your baking equipment repertoire. 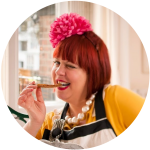 I’ve been working with South African stone fruit recently and last week I did a whole supper club menu using the fruit in both sweet and savoury recipes. This recipe uses yellow fleshed nectarines which you can cook or warm, if needed, unlike the white fleshed nectarines. This recipe makes two tarts so halve the ingredients for one. I don’t know how you will use half an egg though. Make a teeny weeny omelette? In this recipe you will be baking blind. This is a technique that makes sure the pastry at the bottom of the tart doesn’t go soggy when you add the filling. So you’ll need either baking beans or pulses (which you use for only this purpose) to weigh the pastry down. In a stand mixer using the beater attachment or by hand with a wooden spoon, beat the butter until soft, then add the sugar until the mixture appears fluffy and white. Gradually add the egg to the butter. Mix the flour and salt.Then add the flour/salt bit by bit until it forms a dough. Press the dough into a disk and cover with clingfilm. Leave in the fridge for half an hour to rest and chill. Prepare your baking tin (using butter and flour) meanwhile and preheat the oven to 200ºC. Make the creme patissiere. Mix the sugar and eggs together in a bowl. Add the flour and cornflour to the sugar/egg mixture and stir until smooth. Heat the milk, vanilla paste in a small saucepan on a medium heat. Don’t let it boil. Add a tablespoon of the hot milk to the sugar/eggs/flour and stir. Then slowly add the rest of the hot milk, whisking all the time. If the mixture leaves some eggy bits, then strain this into a clean bowl. Cover the bowl with cling film. 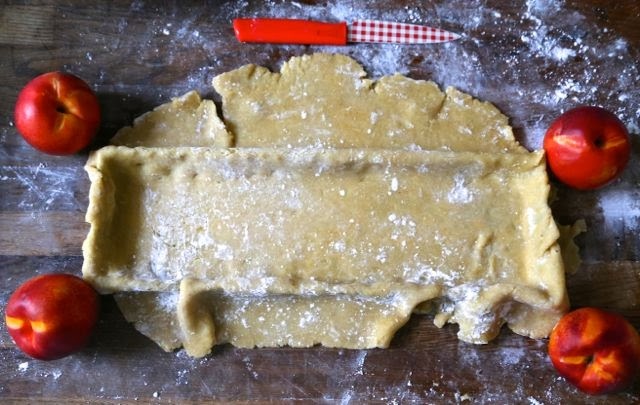 Place the dough into your prepared rectangular baking tin and cut off the excess (not too much as the pastry will shrink when cooked). Prick all over the bottom with a fork. Put a sheet of tin foil or parchment paper into the baking tin and fill with baking beans. Bake for 5 minutes then remove, let cool. Remove the sheet of foil/parchment and the baking beans. (Retain for the second tart if making). Put the apricot jam into a small saucepan on a low heat. When it becomes warm and more liquid, use a pastry brush to baste the bottom and sides of the tart shell. Then fill the tart with a layer of creme patissiere. 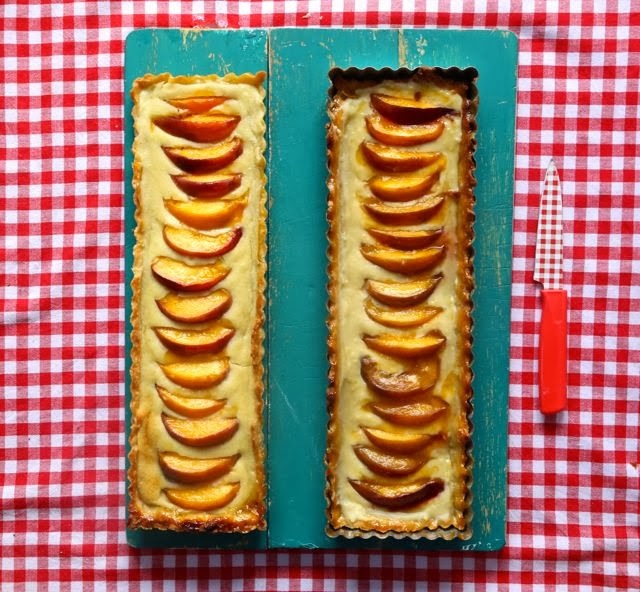 Slice the nectarines and place the slices down the centre of the tart tin at regular intervals. Brush the top of the nectarines with more apricot jam. Bake the tart for another 5 minutes if you want it to be warm. Otherwise serve cold. Remove from the tin by pushing up on the removable base.